When you think of removing hair with an epilator, there’s a good chance you think of women using the device on their underarms or legs. However, some men also want in on the action to remove fast-growing facial and body hair for longer than shaving or waxing can. That’s why we’re providing this guide to help you find the best epilator for men. These handy tools can be gentle enough to remove hair from the face and neck but can also pull out the toughest hairs on the back and chest. The Emjoi AP-18 Emagine is an epilator specifically designed for men, and its 72-tweezer head offers plenty of power to remove body hair on men quickly. The Panasonic ES-ED90-P Wet/Dry Epilator and Shaver could be one of the best options for men who want an easy way to remove facial hair for longer than shaving. The cordless device comes with a gentle epilator head for comfortable hair removal on the face. The Emjoi AP-18MS Emagine Epilator for Men is one of the most popular men epilators because of its ability to remove hair for up to six weeks with its head packed full of 72 tweezers. The Braun Silk-épil 9 9-579 Epilator is a device made for women but has a wide epilating head, a shaver attachment, and other helpful additions that can benefit hair removal for men from the face and body. 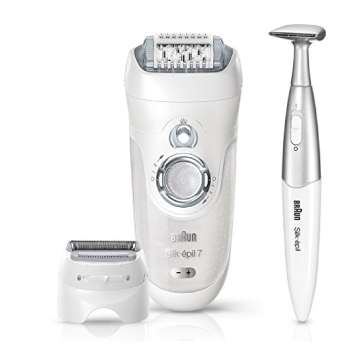 The Braun Silk-épil 7 7-561 is an older version of the Silk-épil 9 but some men may like its lower price point for a device that offers many of the same benefits, like wet and dry epilation and a pivoting head. In this guide, we’re reviewing five of the best male epilators on the market. 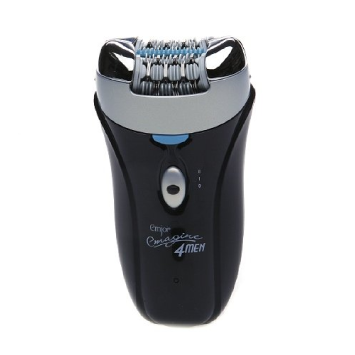 Some of them are actually designed for women, but they fit the criteria that a good male epilator should have, which you can read more about below the reviews. The Emjoi AP-18 Emagine is a woman’s epilator but it has many of the features you’d expect in an epilator designed for men. Most notably, the 72-tweezer head is one that should help you remove a lot of hair in the quickest time possible. The head also contains a central lifting system with tiny “fingers” that lift the smallest hairs to help the epilator grasp and remove them. This epilator uses Emjoi’s Patented Glide Technology, which helps the tool move over the skin smoothly as it lifts the hairs in its path, leaving you with less discomfort. The Emjoi AP-18 has two speed settings to help you control your comfort and the epilator’s performance depending on where you need to remove hair. The higher speed may work best for your chest and back while the lower speed might give you more comfort when using it on your face. People who have used this epilator say that it can even grasp the tiniest facial hairs without needing to shave first. 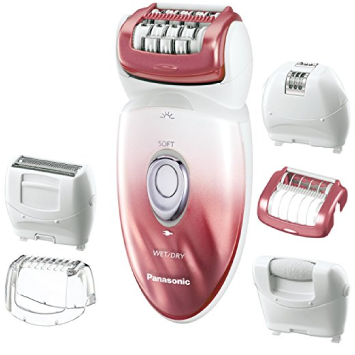 The Panasonic ES-ED90-P Wet/Dry Epilator and Shaver comes with a set of attachments that can be beneficial for men who want to remove hair from their face, neck, or body. The bikini comb can come in handy if you want to trim your groin area, while the gentle epilating head and gentle epilator cap can be used separately to increase your comfort when you epilate sensitive areas like your face. Some customers who have purchased and used this epilator say that the regular epilator head tends to pinch skin but that the gently head can help to reduce some of the discomfort. 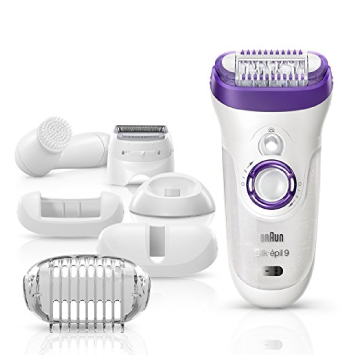 This device is Emjoi’s men’s version of the Emjoi AP-18, and it’s also the first epilator explicitly designed for men. 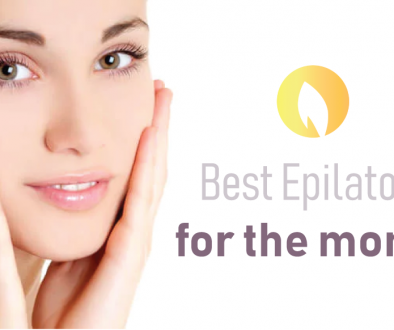 You’ll likely notice a lot of similarities in the two epilators but there are a few things that set it apart. The male version has a 17mm disc opening, which is a bit larger than the version for women, making it possible to remove as much hair as possible. The disc opens and closes as the epilator moves, which helps keep skin taut for optimal hair removal. Emjoi’s epilator for men also comes with a handy shaving attachment that the women’s version does not. This can be helpful for you to use before epilating to remove tiny hairs on the face and neck that the epilator won’t be able to grasp. This version also has a slightly different head shape that allows the device to reach shorter hairs than the women’s version might be able to. Several customers praise Emjoi’s men’s epilator for its ability to remove hair from sensitive areas without causing as much pain as other epilators. The Braun Silk-épil 9 9-579 Epilator is another epilator meant for women that can likely hold up to a man’s hair removal needs. This epilator comes with several attachments that you might find helpful depending on where you want to remove hair. The Braun Silk-épil 9 comes with a shaver head and trimmer cap, both of which may help you get efficient, long-lasting hair removal on the face. Use the shaver to trim small hairs before epilating and then use the trimmer cap to reduce discomfort when removing hair from sensitive facial skin. The wet and dry feature is convenient for you if you want the choice of epilating in or out of the shower. Since it’s cordless, you can take this device with you wherever you go. Most customers praise this handy device for its ability to keep their face and bodies free from hair for several weeks at a time. Braun Silk-épil 7 is an older version of the Braun Silk-épil 9, but it offers many of the same features at a bit of a lower price point. This epilator comes with a shaving head that you can use to remove short hairs that the epilator won’t grasp with its tweezers, although you should be able to remove any hairs that are at least 0.5 mm long. The Braun Silk-épil 7 has a pivoting head that can help it contour to your body, especially when removing hair from your face. Turn on the LED light to make sure you don’t miss any tiny hairs that can be difficult to see. People who have used this epilator note that the pivoting head helps them avoid missing hairs that they sometimes would with a razor. Just knowing our picks for the best men epilators isn’t enough. You should also understand why we chose the products we did for men’s hair removal so that you can get a better idea of how they can work for you and how to select the right one for your needs. What’s the Difference Between the Best Men Epilators and Epilators for Women? The most notable differences that you’ll find in epilators made for men and those made for women are the number of tweezers and the size of the epilator head. Men tend to have coarser and more hair than women, so they may need more tweezers to remove hair efficiently. With broader epilating heads, these devices can remove more hair in a shorter amount of time. However, some women’s epilators can also work for men, especially if they have several tweezers and are powerful enough to grab stubborn hairs. The number of tweezers is one of the most important things to look for in a men’s epilator. Many models have somewhere between 20 and 40 tweezers. For maximum efficiency when epilating, it’s a good idea to look for a device that has 40 tweezers or more. This will help you remove as many hairs in as little amount of time as possible without having to guide the epilator over the same spot repeatedly. The ability to move over the curves of your body is an essential feature for any epilator to have. However, men may appreciate this feature even more because they may use their epilator more for removing facial hair than women do. Your face has a lot of curves and angles that can make it easy for a non-contouring epilator to skim over, missing the hairs along the way. Some epilators have heads that move in different directions, which allows it to glide closely over almost any shape to catch the hairs in its path. Your epilator should do everything you need it do, which is why looking for a set with extra attachments can save you both money and time on hair removal. Many of the best epilators come with an attachment specifically for removing facial hair that covers some of the tweezers to reduce pain on sensitive skin. Others also have shaving attachments that help you shave tiny hairs that your epilator might not be able to grasp. Our pick for the best epilator for guys is the Emjoi AP-18MS Emagine Epilator for Men. Not only is this epilator one of the few on the market that’s designed specifically for men, but it also offers some of the most bang for your buck. Thanks to its ability to pull skin tight as you glide it over your skin, this epilator may give you the most comfortable hair removal possible from an epilator. With 75 tweezers, you should be able to remove hair quickly. 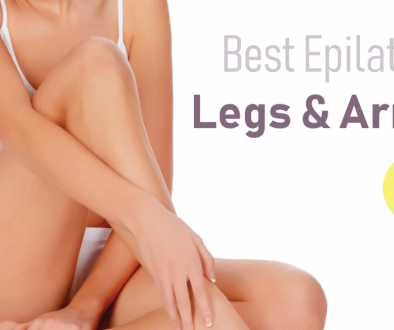 We hope that our guide to the best epilator for men gave you some good advice for choosing the best epilator for your needs and some helpful suggestions for the best men’s epilators on the market.